Nice set, backs are low, cushions are ok. I can see haveing to buy cushions soon. Arrived damaged , but overstock replaced entire set. Overall I’m happy with it for the price. 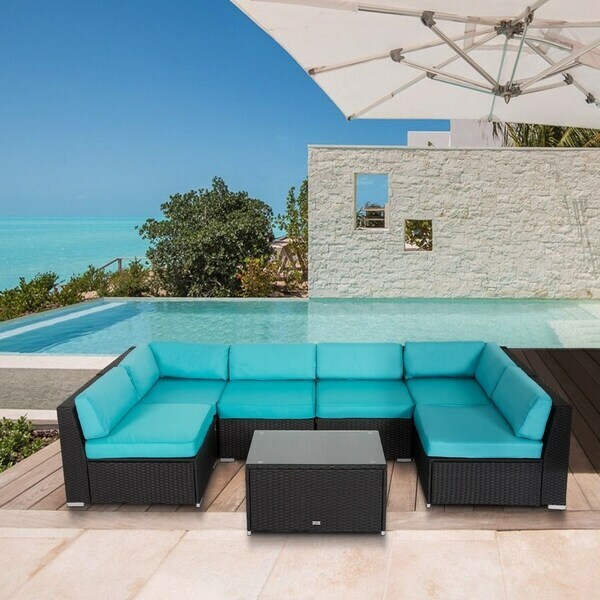 The outdoor wicker sofa which feature durable frame and padded cushion is ideal for patio, deck, garden, balcony, a great place to fully enjoy yourselves. Constructed of a rust-resistant steel frame with weather-resistant PE rattan wicker, the patio furniture set is durable and comfortable for a long term use. A sleek and modern design is provided with simple yet attractive outlines while thick padded cushions with removable and washable covers ensuring added comforts. The outdoor conversation set is designed to match the style of your home and is appropriately sized so that it can be arranged in a variety of ways. 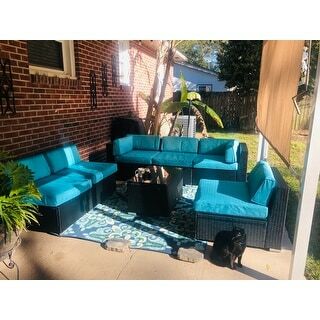 Love the colors and durability of this set, the rattan/wicker is very durable and I see it lasting for a very long time, cushions are vibrant and very comfortable. As other reviews the set does sit low but that is not an issue to me as my small dogs are able to get up and sun bathe! The assembly is a bit tedious and will take several hours or more, my husband got this fun job and complained the whole time! Once done it is stunning and very comfortable. I'm in love with the Kinbor 7-piece Outdoor Furniture Set Cushioned Rattan Wicker Sofa Inclined All-Weather Patio Sectional Sofa Set! It's beautiful and comfortable. It took a minute to figure out the assembly but once we figured out how everything worked it didn't take a long to complete it. I'm very pleased with this product and highly recommend it! The Kinbor 7-piece Outdoor Furniture Set Cushioned Rattan Wicker Sofa Inclined All-Weather Patio Sectional Sofa Set is a very nice looking set with seemingly good quality plastic wicker and a bright and lovely colored cushion - however the one we got was defective and ultimately had to be sent back. The bolts were too short to go through pieces to be assembled and it seemed that parts were missing nuts that were welded to some portions of the set - but not welded to other portions. In addition this set is quite short which may be bothersome to some. The padding in the cushions also seemed quite cheap resulting in some of the cushions having creases that didn't settle out over the couple of days that we had the set out while we tried multiple different ways to assemble the set and invited guests to do the same (just to make sure that it wasn't just us that couldn't assemble the set). It really is sad that this set didn't work out as it would have looked great on our back porch - despite the small stature of the set. I would highly recommend one look very close to the dimensions and even measure them out so that you fully understand the size of the set before buying. The size would have worked well for us - but our guests seemed to be concerned for us about the size. Ultimately due to the fact that the product could not be assembled we had to return it. Overstock performed as expected and provided shipping labels to return the product at no cost to us - and will provide a full refund upon receipt of the defective unit. See attached pictures which show that the bolts are all the same size - yet some assemblies hove internally welded nuts and others are meant to go all the way through and have a nut and washer on the other side - yet it doesn't reach. 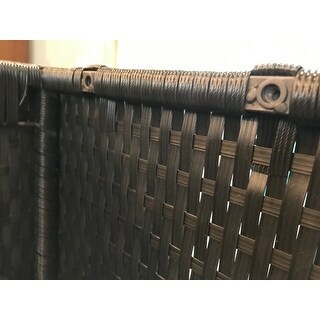 Note that the wicker seems to be good quality - of course this was just at a glance and we never were able to try sitting on the product since we and our friends couldn't get the thing assembled. I should also note that we are advanced users - being people that are exceptionally mechanically inclined. I hope our review has helped you in your decision. Please like this review if it has helped you in your decision in any way. The order arrive on time and in good condition. The Patio Sofa Set is beautiful and the contrast between the black rattan wicker is nice when accompanied with the aqua blue cushions. Assembly instructions are pictures however after getting the first piece together, the remainder of the assembly was easy. 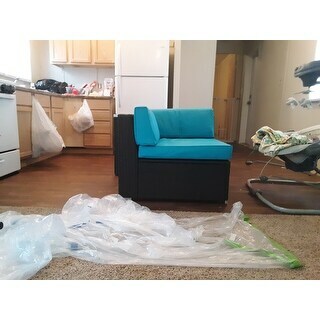 The pieces are held together with plastic clips and the sofa is very comfortable to sit on. This product has a solid construction with a contemporary comfortable design. It allows for configuration of different spaces which is great! I haven't had it long so my only concern is how fast the pillows will fade with sunlight. Time will tell. The outdoor furniture set appears to be very solid and will last a long time with proper care. It was well packaged in 4 separate boxes. This is not a quick snap together set which will fall apart in a few weeks of use. This is a nut and bolt assembly and will take some time to put together. Taking my time with the simple tools they provided in the kit and a set of needle nose vise-grip pliers took me alone about 8 hours to assemble. The assembly directions are a total joke! It say put part A to C but no markings on any of the pieces to tell you which is which. I had to decipher which piece went with each other (Hint: keep boxed parts together to make assembly easier!) and you had a nice puzzle to keep me busy all day during a snow storm up in the PA mountains! The set takes some time to put together but with some tools not provided like a Phillips screw driver, needle nose pliers, ratchet set with Allen wrench tips and small clamp it would go much faster! A second set of hands would also make go much faster to assemble. The set is very well built and solid but some of the metal bracing was not bent correctly and when putting pieces together there are large gaps which I had to pull closer together with my hand while using other hand to put screws in. If you have a small clamp or needle nose pliers to clamp the pieces together it would go together much easier and FASTER! I can highly recommend this set!!! It appears as a real hassle but with the tools mentioned and a helper it would most likely take less than 3 hours to put together. It seems like a long time but it is a solid set and will last! 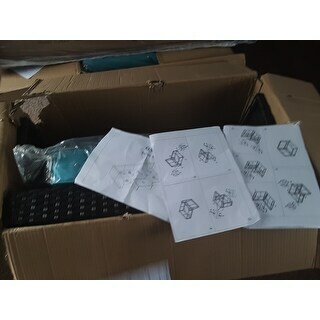 The pictures of the product are very accurate and the set is beautiful, solid and comfortable to sit on, lounge on, nap on or even sleep on as a bed for additional unexpected guest! I love this set. The color I chose is Red. I am doing a Polynesian style 3 season room. It is a job to set up, it came in 4 large boxes with instructions. The price was amazing based on my shopping comparison, but I am willing to put in the work to put it together for this price. Just uploaded a picture of the Kinbor 7 piece set in Red. Love it! This sectional looks wonderful. It is comfortable. If you are looking for a set with a high back, this set is not for you. The back of the sectional is low. The cushions are comfortable. The assembly is quite time consuming. No clear decorations included. Easy to put together, the color was exactly as pictured. Like that there were clips included to keep the pieces together. Also surprised that the cushions were very comfortable. Very nice, but very bad quality! I just put these in my patio 3weeks algo and the cushions have lost their color. Color was beautiful for the first 2 weeks now we have light blue on one part and whitish on the other. very disappointed! Would not recommend buying. NOT worth the money! It looks great and was not difficult to put together! This turned out great for me and my family. The color is beautiful and the cushions are comfortable. However building it was a nightmare. 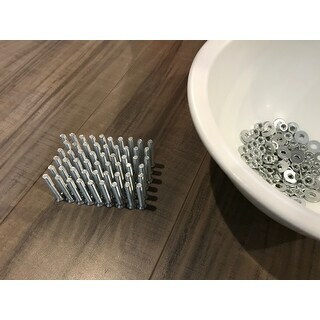 The pieces come unlabeled with fasteners that are also unlabeled. The directions are just four to five pictures with no words, like blueprints. I built it alone and it took about 6 hours over two days. pieces come in four packages. Seems sturdy though. And it moves easily into many configurations. I hesitated to purchase this as it seemed to be too good of a price. I am so glad I took a chance. The cushions are the ocean-aqua blue like I was hoping and not a baby blue. It did take some time to put together approx 6 hours. But it is everything I was looking for at half the cost anywhere else. We like the color and the price.. Doble settings provides more room. 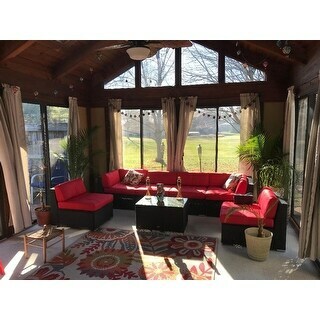 I am creating a Polynesian style sun room. The red will add bright color. The price was too good to pass up compared to other sites which were double the cost. It also had great reviews. I chose this product because we found it in orange and loved it. Unfortunately, the orange sold out right under our noses. The price is fantastic for the amount of furniture you receive, the ratings are great. Hopefully we'll have success when we receive it.